Gavin Barrett was among those strangers who helped me when I came to Toronto in July 2008. Although he’s from Mumbai I met him in Toronto. As it turned out, his suggestion led to my working at the Indo-Canada Chamber of Commerce. 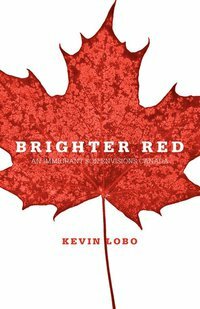 After reading Kevin Lobo’s book Brighter Red: An Immigrant Son Envisions Canada, I realise Gavin, besides being a successful advertising professional, has also made it his avocation to help newcomers to Canada. I’ll write about him later, perhaps when he restarts writing poetry. This blog is about Kevin Lobo's Brighter Red. Kevin Lobo is a man we should take seriously. He will be representing us in the federal parliament one day in the very near future. I'm convinced about that after reading his book. And when that happens, we’ll be in safe hands. Again, I say this with conviction because the underlying feature in his memoir and political philosophy (he terms it his “Simple Dream”) is tolerance. Kevin’s a Conservative and I don’t agree with many of his political views. But what comes through in his book with clarity and sincerity is his tolerance to differing views. He also has a rare trait (and one wishes it’ll last) is an ability to probe his own beliefs and hold them up for scrutiny. Brighter Red begins as a memoir and Kevin narrates his immigrant story with detachment. Again, this is rare. I’ve been an immigrant here, too, and I doubt if I would be able to narrate my story with the same sense of detachment. He quickly moves on to his political philosophy and discusses the various socio-political and economic issues that beset Canada. Here, too, his descriptions, his arguments, his advocacy of alternatives are based on a deep-rooted understanding of the issues. He doesn’t adopt a journalistic style of being on an even keel while writing, neither does indulge in needless hyperbole. That is not to imply that he doesn’t feel passionately about these issues. He does and given an opportunity, will definitely shape officially policy with passion. Finally, the heartfelt praise of the Indian ethos in several places and in different contexts in the book surprised me. In the nearly two years that I’ve been here in Canada and have interacted with immigrants from India, I’ve met some who feel acutely embarrassed to acknowledge their Indian roots. Kevin lavishes fulsome praise on India. That is so rare and commendable, especially so because he immigrated to Canada from the Middle East and must have left India many years ago.